The Crowne Plaza hotel, idyllically situated on the River Thames at Caversham near Reading, provided this year’s backdrop for the Travel Retail Consortium’s annual customer event. TRC members and guests from UK and European based airlines, airports, ferries, concessionaires and distributors enjoyed an afternoon and evening of business and social networking, culminating with a fun River Cruise from Caversham to Pangbourne and back. The afternoon began with business networking in a mini trade exhibition setting, watered down with Taittinger Champagne, cocktails from Accolade and Remy and afternoon tea. Each stand tempted guests with fun competitions to win prizes and gave members a perfect opportunity to introduce new products and collections. TRC members and guests were also encouraged to enter the annual raffle, which this year raised £545 for the Childrens Hyperinsulinism Charity, a UK based organisation to support families who have children with Congenital Hyperinsulinism by holding conferences, raising awareness and funds for research. Said TRC Chairman Rebecca Harwood Lincoln: “This charity is very close to home for us as one of our member’s daughters suffers from this debilitating condition. We are delighted at the generosity of everyone at the event today and thanks to all our members for their support in donating some fabulous prizes.” After time to relax and spruce up, attendees enjoyed a four hour River Cruise along the Thames enjoying gentle jazz music and a splendid buffet – again with ample refreshment supplied by Taittinger, Heineken and Accolade Wines. Added Rebecca: “This event is designed to be a very relaxed occasion for all of us to network in a fun social environment. We introduced the product showcase element at Ascot last year and this was very popular, enabling guests to see, touch and feel TRC member’s product lines. This year we repeated that format, which again worked very well, creating talking points without any hard sell. 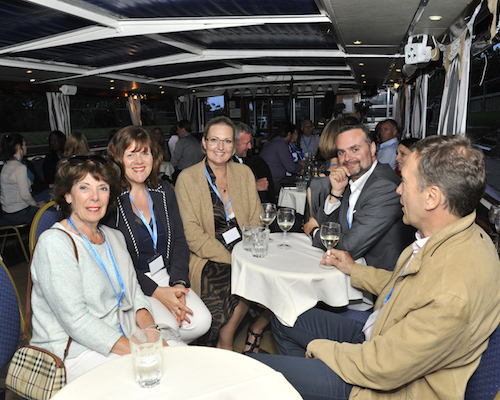 “The River Cruise was completely ‘non-business’ and enabled us all to connect in a very informal setting; the fact that the bar back at the hotel was still pretty busy well into the early hours indicates the success of the event The occasion is certainly welcomed by guests. “The TRC events are a highlight in our team calendar!,” says Harding Retail Category Manager- Duty Free Division, Hilda Gillham. “We very much appreciate the time and attention that goes into planning the diverse events that bring together so many friends and colleagues from the industry. The chance to network with different brands and retailers is always welcome, especially outside the usual frenetic buying schedule. A huge ‘thank you’ to the TRC Team for continuing to include us on the list! Look forward to seeing you all again next year.” Adds Dufry Group Procurement Director, Nigel Keal: “"Well done to the Travel Retail Consortium for another well organised and enjoyable afternoon and evening. It's always good to catch up with industry colleagues and friends in an environment that is more relaxed and casual than the normal Travel Retail conferences and exhibitions and the TRC manages to do this very well. The evening jazz cruise was a particularly pleasant way to spend a few hours; while the afternoon provided useful time for seeing some of the latest and best selling product on offer by the members." DFDS Category Manager, Will Attersley also appreciates the networking opporuniity: “The TRC have put on yet another fantastic event that encouraged both suppliers and buyers to interact in a relaxed informal way. We can discuss current business and explore new opportunities. It’s a great networking opportunity and for us at DFDS it is highly appreciated and valued. Congratulations to all at the TRC for executing it perfectly,” he says. Attending the day were representatives from Ambassadors Choice, Condor, DFASS, DFDS, Dufry, Harding Retail, Jet2.com, Macintyre Scott (MSX), P&O Ferries , Scandlines, Tourvest and WH Smith.